The TRS came E X A C T L Y four weeks to the minute of order. They promised 4-6, and they delivered right on time (early in my mind). 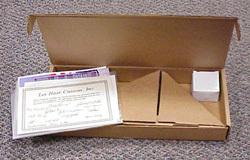 As expected the packaging is a cardboard box…nothing more than brown and plain. There is even a plain white sticky label with TRS and the serial number on it. I would prefer 5 bucks off a firearm, then a fancy case…I think the TRS pound for pound, is a good value over a Wilson CQB or another in its’ “class” but that is a whole other story. This is one of those places that they cut a few bucks off…but function is there. After opening the box, there is some propaganda on Les’s AR-15, and a catalog. Baer includes these things with every order (even if you buy a magazine/clip) a stack of reviews done by magazines on the new AR-15…Also in the box is a gun lock, 3 seven round magazines, and a piece of paper with all the folks at Les Baer Custom Inc. signatures on them. A nice touch in my opinion. The thing I thought you all might find curious is the plastic baggie (zip-lock type thing) that the TRS was in. It was chock full of lubricant of some kind. I would not call it grease, because it was too watery for that. But it is definitely DRENCHED in oil. Cool enough, I actually would prefer that…keeps it clean in shipping. I however did not find it as bad as some other have. I guess I thought it was a good touch. After I took it out of the box, and then bag, I wiped it down with a paper towel and gun cloth. Contrary to what I have read in the past, the dehorning job is done well. The edges are like butter. The finish was flawless, and fit was, well really tight. Nice and tight. In the best of all possible worlds one wants a tight gun, that can shoot accurately and function very reliably. As you will see the Baer did so on both accounts. I being the person I am, took the slide assembly apart and went about cleaning it. I especially wanted to look at the barrel fit job, and instantly noticed that the slide, barrel, bushing , extractor and other are etched for matching up. My guess is they are working on several TRS’s at once, and want to keep the parts matched up. To me this is just an obvious example of hand crafted. 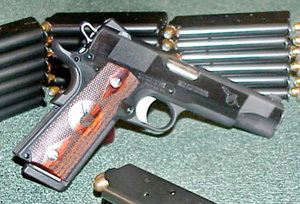 There are plenty of guns that come with a few parts etched with numbers to match, but not most parts. The barrel fit as it should. Tight on the bushing but not OVERLY tight. It fit against the ejection port as it should (no daylight between the end of the barrel – where the bullets feed – and the slide when in place). Now as far as tight goes, the break away tightness was there. Once it broke free of the first little tightness, it was fine. For example when you let the slide go and the last 1/2″ is real tight, that IS GOOD…that is where once you shoot a 1000 rounds, the gun will loosen up. If it is tighter than that, I might not carry it. It is amazing how you can actually talk about degrees of tightness with a Baer. 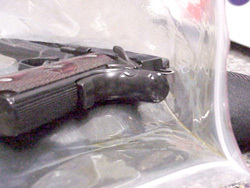 Other manufacturers DO NOT provide a gun this tight (Rock River Arms does – but they are Ex-Baer guys). I consider tightness good. Most circles consider tight as a problem for reliability but good for accuracy. Baer obviously defies this law. After the cleaning with MPro7 I oiled it up with Mpro7 oil…I applied extra to the barrel, the bushing and the rails. When I say extra, we are talking just that. Almost drippy like extra pepperoni pizza. I was going to be pounding a few rounds through this puppy, and the last thing I wanted was to not be lubed up enough. After pawing it for 6 hours on Saturday, I got my stuff ready for the range the next day. Like a kid on Xmas eve, I could barely sleep. I was up at 5am, and ready to go at 7am to the indoor range (open 24 hours). I tried the 7 rounders at home, and they were timed well. Timing involves using a blank cartridge (no primer/powder) and slowly bringing the slide forward with one round in the magazine. The round should slide up with out jumping ahead of the extractor. This is a whole other science. I also tried some other Baer 8 rounders, and they worked well. All told, I could have 53 shots loaded each time I filled the mags up. I would like to add that the night sights on this gun are also very bright. I like that. The other nuance I liked was the night sights were also grooved on the side for ease of grabbing the back of the slide. On Sunday I took it to the range. I was nervous and excited, but the first shot quickly got me into the game. Four hours later I had shot about 750 rounds. I shot about 500 230gr Federal FMJ, 100 Federal 230gr Hydra Shocks, and the rest was two boxes of ANYTHING 45 I could find (mostly left over carry ammo-hollow points). You all must have that leftover ammo box, that you are always meaning to bring to the range and shoot off…well I saved mine for the Baer. About 100 rounds of just pure mishmash, hollow point, wad, semi-wad, Winchester, 3-D, Cor-Bon, the whole 9 yards. I had only two failures. One was a jam on FMJ when the gun was hot and dirty (at about round 100) and another was a stovepipe (on about 175). I think those are good odds. That is rock solid. At round 350 or so, I took the slide off and ran a bore snake through the barrel about 8 times. I then lubed it up as much as I did when I prepped it for the range. I was ready to keep the brass flying. My excitement left early in the shooting. The gun clearly shot low and left. I did get the “brass” marks on the slide right where the ejection port is opened up. This “seemed” to go away towards the end. The shooting lower left though was disappointing. It happened to three others I let shoot the TRS a little. I can tell you the ONLY part that is hurt, or sore, is the part of my finger I use to load mags . The checkering was beautiful, and the memory groove on the safety was great. I could have easily shot more, but the people with me tired sooner than I so I had to cut the range time short. Once home, I stripped it down and cleaned it. It cleaned up REALLY REALLY easy (I was surprised). I was disappointed, because I wanted it on my hip that week…and well, I set my mind straight quick, that I would send it back for site adjustment. I called Les Baer first thing on Monday and the lady was, as usual, pleasant. She said the brass thing might go away, and to use blah blah solvent on a cloth and it would come off…She said the sight thing they will fix, just shoot a target and send it back with the gun. So during the day, I hit the range, and shot on some brown paper. The groups are about 12″ low and 6″ left…The lady had told me probably 1-2 weeks or so. I don’t mind and OF COURSE I have my theory. I talked with Les Baer himself – what service. 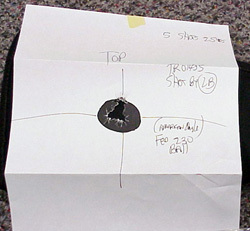 Les stated that he has not seen this wild of an adjustment needed but that he could adjust the sights in order to bring it to point of aim (POA) for the targets I sent him. Changing the front sight (putting a lower sight) and adjusting the rear will get me there. He did mention that Shooters Choice Copper Remover would take off the brass marks. He said they most likely never go away. He said just soak a cotton patch with the copper remover, dab it on the slide. Then leave it sit for five minutes and then proceed to wipe it off. Make sure that you oil that part because the copper remover also removes the natural oils. Les was nothing as I expected (as usual pre-notions are often wrong). He was extremely nice and super cordial. He was a great combination of professional, and leisure. Folks will say “you spend that kind of money on a gun he should take care of you”…but I can tell you this…99.9% of all companies I deal with whether I spend 200k or 200 dollars treat you like garbage. There are a few elite companies that have good practices and treat the customers like they TOO would want to be treated. In my business my customers buy one piece for anywhere from 400 to 40k and they get the kind of service I got today. Les’s business is all 1200-6k…so one guy buying one gun is not going to make or break him. He was just a SUPER nice guy. Well he said the gun would be returned on Monday (he just wants to torture me for the weekend without it). Any ominous feeling I had dissipated quickly today. The gun came back with a small note from less and a target. There was of course no charge. Here is a 25 yard target Les sent to me. This is nothing shy of PHYSICAL PROOF that Baer has solid service. Back from the range and all was perfect. It is as easy as that!! 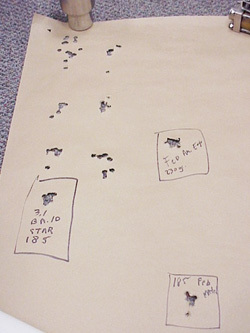 The top LEFT of this target is simply the first 20 shots, warming up the gun…These are all shot at 25 yards. Notice the 3.1 BA10, these are 10 shots at 25 yards. This gun is amazing…it literally should sell itself. It only had the first hiccups (two) the first 200 rounds, and over 2000 later, not a burp.